To score a running total of 500 points. Using a regular 52 card deck, remove the 2's and 3's. Add a single joker. This is the Rook. 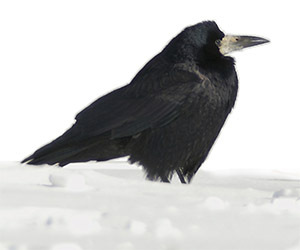 The Rook is treated as a low trump card (3 of trump). This makes a total of 45 cards. Deal three cards face down into the Nest and eleven cards into each player's hand. Alternate dealer after each round. The non-dealer bids a minimum of 50 points and up to 140 (maximum points possible per round). Players alternate bidding in multiples of five points (a bid must exceed the previous bid) until one player chooses to pass or a player bids 140 points. The winner of the bid declares trump (a suit) and then adds the Nest cards to her hand, discarding three (non-point) cards, which are set aside for the round. The remaining 20 cards are placed face down and form the draw pile; the top card is turned face up into its own "pile" before each trick; this forms the second draw "pile" (of one card). The bid winner leads any card in her hand, playing it face up on the table. The winner of the Trick is the player who played the highest trump card or if no trump card is played, the highest card of the suit lead. The winner takes both cards and places them face down in her stack of tricks winnings. The winner of the trick chooses either the face up card or the top of the draw pile; the opponent takes the opposite. The face-up draw "pile" is replenished from the next card on the draw pile. Play proceeds with players playing down and drawing cards until all cards are drawn and all cards in the players' hands have been played. Rook (joker) is 20 points. All other cards are 0 points. In addition, the player who won the most tricks is awarded 20 points ("Packs"). If the bidder met or exceeded her bid, she adds her score to her running total. If she falls short of her bid, the bid score is subtracted from her running score. Non-bidder adds her score to her running total, regardless. A new Round (Deal, Bidding, Play) begins unless a player's running total reaches 500 points, in which case she is declared the winner.